Maximising retail sales online will make a huge difference to your salons turnover. 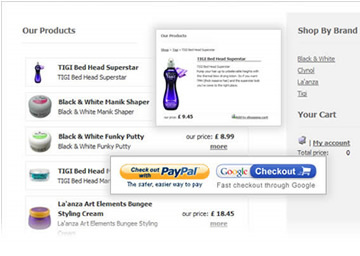 Intersalon makes selling salon products online easy. The salon populates their own product database and decides which of these products are available for purchase online. Stock levels are automatically adjusted for each order processed through Intersalon irrespective of whether that order is initiated online or from within the salon as a walk-in purchase. The salon can choose to ship products or allow customers to reserve their products when they make their booking for collection in salon. By linking the shop with the online booking system enables the salon to recommend the right product for the service at the time of booking. Configurable discount levels for students etc. Multiple currency and shipping options for overseas sales.